Looking back, it would seem like the writing was on the wall the whole time. 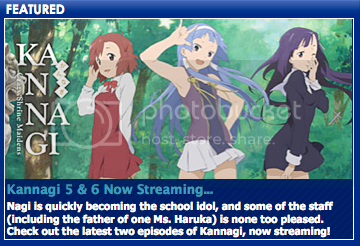 In the weeks that followed Anime Boston, an English language website sprung up that paid tribute to Nagi, the lead female protagonist in Kannagi. 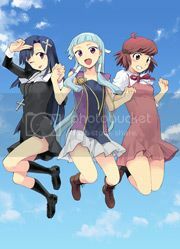 When Otakon announced that anime director Yutaka Yamamoto would be a guest at the convention this year, they put a huge emphasis on his work on Kannagi and encouraged the press to post up a picture of this anime series in particular. This seemed very odd considering that Yamamoto’s other credits, The Melancholy of Haruhi Suzumiya and Lucky Star, were far more popular among American otaku than the unlicensed Kannagi was. Then a mysterious ad appeared on the Anime News Network linking to a countdown under the title “OMG, It’s Coming!” The countdown was set to go off the day before Otakon, so we figured it was related to that event. The connection became apparent when the English Kannagi website announced a major announcement to come at the same time the OMG countdown was set to go down. The ASOS Brigade website, a marketing campaign that Bandai had executed years ago with the license announcement of Haruhi, updated with messages mocking the OMG countdown for being an unoriginal idea. So we could put the pieces together to figure out that Bandai would be announcing the Kannagi license the day before Otakon, but no one ever saw the massive scope of this announcement coming. When the countdown reached zero, the Anime News Network began streaming the first two episodes of the series for free on their website. And on top of that, Bandai had an exclusive partnership with online retailer Right Stuf International to take orders for the Kannagi DVD and have it shipped out the next day. Although online streaming has become normal thanks to Crunchyroll and FUNimation, this next day DVD release was completely unprecedented in the American anime industry. As a result, it created quite a stir among anime fans and anime shop owners. With in just one day, Bandai had successfully brought the months-old series back into the fandom’s consciousness and it became the talk of the internet community. It was an amazing display of brand marketing that weekend, so why did Bandai choose to do it with Kannagi of all series? The plan is to strike now while the buzz and hype is big for the anime series and fans are more inclined to buy on impulse. Bandai is even sweetening the deal by offering a free t-shirt to fans who buy the first DVD and pre-order the second DVD at the same time. Once the hype is gone and Bandai has squeezed all they can from that core audience, then they’ll start reaching out to a more mainstream market. The sub-only release has been a point of confusion from the fans because of how Bandai released Gurren Lagann last year. They had initially release a sub-only version of the show and then later re-released it in a package that included an English dub. Many fans, including myself, were expecting this to be a new marketing strategy that we’d see again with the release of Kannagi. Without the pressure of a traditional TV broadcast, Bandai is completely free to handle the release of Kannagi using nontraditional methods. But this comes as quite of a shock as the company has long since shared the Japanese belief in being very conservative and weary about breaking from tradition and embracing technology. In fact, less then two years ago I was harshly criticizing Bandai’s CEO Ken Iyadomi for his comments denouncing the internet and global distribution. This is the second unique license and release from Bandai this year as they started off 2009 with a simulcast of the anime series Kurokami. In another unprecedented move, that series was dubbed into English during the show’s development, and each episode debuted the same day in Japan, Korea, and America in those country’s native language. The problem, however, was that the series was only broadcast on a small cable network in America that was not widely available. Therefore, despite the rush Bandai made to dub the series in sync with Japan, most of the English speaking audience still couldn’t see it. “There was always going to be a digital component to the Kurokami simulcast, we just couldn’t get the online deal in time for the show’s premier. They were really set for a simultaneous release in Japan, Korea, and the US all at the same time, so we had to settle with a TV-only broadcast when we first launched the show.” About 20 weeks into the series, Bandai finalized the online deal and began streaming the simulcast on YouTube and Crunchyroll alongside the TV broadcast. So while the rest of the industry turns towards simulcasts to fix the current changes in the anime market, Bandai is now focusing on this new hype-then-blitz strategy for new releases. Did it work out for them? Well, I don’t have any figures or statistics to go by, but the response I witnessed with in the internet community was absolutely phenomenal. I saw dozens of the people I follow on Twitter order their copy of Kannagi from Right Stuf with in days of the announcement. 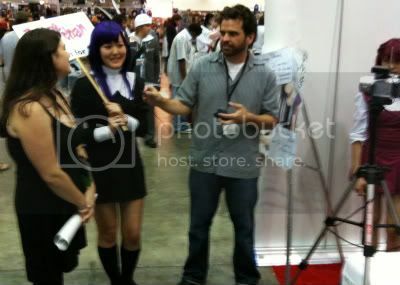 I witnessed many fans with me at Otakon buy a copy of the DVD that weekend and get it autographed by Yamamoto himself. And the amazing thing is that many of the fans who were buying this DVD were the fans I rarely see buy DVDs. In my years of fandom, I have never seen so many people buy the same DVD at the same time like this. And sure enough, Kannagi reached the top of the Right Stuf’s sales chart during the week of this marketing blitz and the pre-sales for the second DVD are still going strong. And sure, these people are with in just a tiny niche of anime fans, but this is exactly the niche that Bandai was aiming for with this marketing strategy. Whatever Bandai did, it worked, and I believe they successfully reached out to the core audience using as little overhead as possible. Can Bandai do this again with another series? Well, we’ll just have to wait to find out. But either way, I’m looking forward to seeing what’s next for Bandai and their crazy marketing schemes. This entry was posted on Friday, July 31st, 2009 at 9:34 am by Scott	.